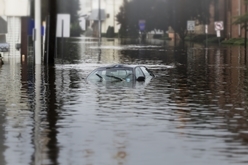 Avoiding the Purchase of a Water Damaged Vehicle | The Consumer Law Group, P.C. When considering a used-car purchase, there are a lot of issues to be aware of. The car could be a returned lemon, it may have been involved in a collision, or it could have suffered water damage. Very often, cars like this are transferred to states other than where the damage occurred to avoid state disclosure laws. Even if the dealership you are working with has a good reputation, they may be selling a car they don’t know the true history of. You should always run a report on the car using its Vehicle Identification Number, but, beyond that, you can do a few things yourself to identify problems with the car—specifically problems caused by water damage. Get a vehicle report. You should always run a vehicle check to see if there is a report of flood damage on the car, but just because it’s not in the report doesn’t mean it didn’t happen. Smell the interior. It is very difficult to completely get rid of mildew and the smell of mold is easily detectable. Get close to the seats and give it a sniff. Feel around. Water can puddle up in crevices that you can’t see. Run your hand down the sides and bottoms of seats to check for moisture and feel all of the carpeting—including in the trunk—for wetness or mildew. Look for corrosion. Look for rust and corrosion everywhere, but particularly on screws, hinges, springs, and latches. Body rust can be covered by paint, but it’s harder to cover rust on fixtures. Examine the fabric. Check upholstery and carpet for water stains and mildew, but also make note of fabrics that appear newer than the car itself as that could be an indication that water-damaged fabric was replaced. Take a test drive. Start the car and run all electrical systems, including lights and wipers as these are often the first to go with water damage. Look for smoke or unexpected sounds as the engine idles. Check the oil. If water has gotten into the engine, the color of the oil may be lighter than it should be and may feel sticky to the touch. Also, take a look at the paper air filter for signs that it got wet. Inspect the lights. If headlights or taillights appear foggy, that’s a good indication that water has seeped in and has not evaporated. The interior mirrors and instrument panel may also provide clues to water damage. Dig out dirt. When a car sits in a flood, dirt and debris are washed into the undercarriage, trunk, and interior. Look for signs of dirt in compartments and crevices. Use an expert. If at all possible, take the car to a trusted mechanic before buying it. A mechanic can put the car on a lift and give it a thorough inspection. If these checks turn up any signs of water damage, remember that there are plenty of other used cars available. Don’t risk buying a car that will have problems sooner rather than later. If you were sold a car that you later discover was a flood-damaged car, you may have grounds to take legal action against the dealer. However, it’s always better to thoroughly inspect the car before you buy it to avoid these problems.